Our fourth summer of straw bale vegetable gardening at the Fair Oaks Horticulture Center featured dwarf tomato varieties and new challenges in 2016. In earlier years (2013-2015) we were very successful, and visiting home gardeners welcomed the straw bale demonstrations with enthusiasm and great interest. Instead of the bales falling apart at the end of the 2015 summer growing season, we were surprised to see that wheat straw bales held together better than the rice straw used in previous years. We decided to grow carrots in the used wheat straw bales over the winter. It proved successful (see photo at right). 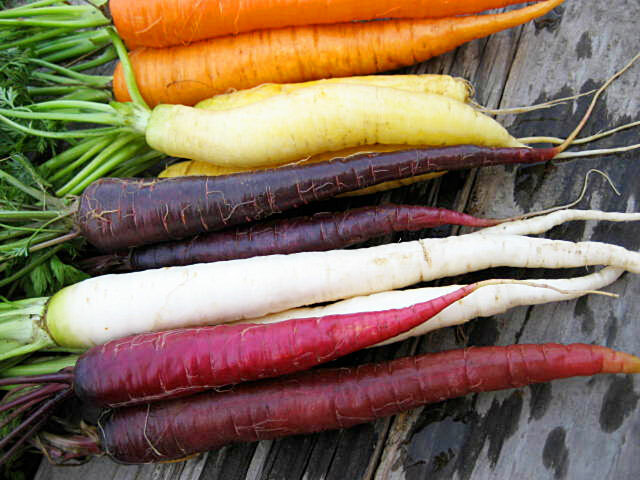 If carrots have been difficult to grow in clay or rocky soil, straw bales can solve the problem. As was done in previous demonstrations, we used the book Straw Bale Gardens (Joel Karsten, 2013, Cool Springs Press) as a reference. In 2015 the book was revised to address some of the questions the author received from readers. For those who are unfamiliar with straw bale gardening, straw bales are not just the container, but also the growing media. As the straw inside the bale decomposes, it provides nutrients for the plants. What remains of the bales the following year can be used as vegetable garden mulch. Garden Note #160 provides detailed information about the advantages of gardening in straw bales, hay vs. straw, setting up the bales, the conditioning process and the types of fertilizers that can be used during that process, and how to plant seeds and transplants into the bales. Two of the straw bales used for the 2016 demonstration were rice straw, while a third was wheat straw. The reason for using two different types of straw bales was to see if one type heated up more than the other during the conditioning process and if one type held up better (did not collapse) during the growing season. This tomato breeding project was a unique, cross-hemispheric, collaborative effort that began in 2006. The goal of the project was to develop and stabilize dozens of new dwarf varieties that produce large-fruited tomatoes with all of the flavors and colors of the best heirloom and open-pollinated tomatoes. The plants behave like compact indeterminate tomato plants, producing fruit all season long, unlike most determinate plants which tend to ripen in a concentrated time period. They’re about half the size, 3 to 5 feet tall, depending on the variety. For more information on the Dwarf Tomato Breeding Project, visit the project leader's website. Prior to planting, straw bales require "conditioning,” which is the process of getting the bales to compost internally so root growth can be supported. During the conditioning process, the bales heated to between 120° and 135°. Both rice straw bales were noticeably more decomposed by planting day. Both bales were slimy inside; however, it was easier to pull out straw to make a hole for the tomato transplants. Both rice straw bales also started to sink and lean a bit. The wheat straw bale looked as it did before conditioning. It was relatively tight, possibly due to a lesser degree of decomposition and, undoubtedly, due to having the folded side up. The rice straw bales had the cut side up. 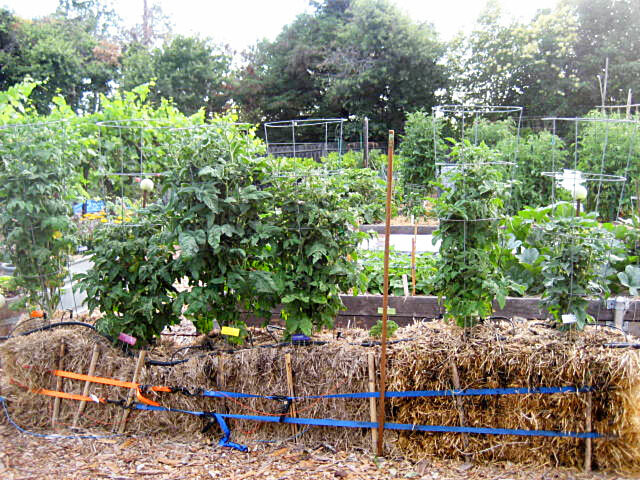 (Note: The book Straw Bale Gardens strongly suggests that the bales be set with the strings located around the sides rather than on the top and bottom of the bales. Because the wheat and rice straw were baled differently, the cut sides were located differently on the bales.) 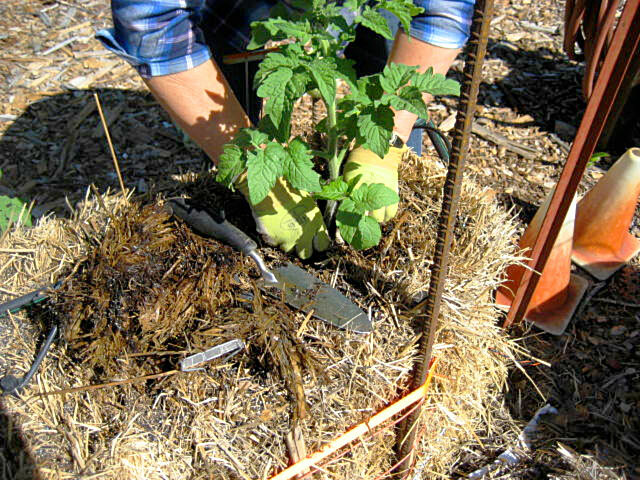 It was quite difficult to remove wheat straw to make a hole for each tomato transplant. A Hori-Hori with a serrated blade and a sharp point had to be used to cut holes in the straw. Mushrooms began to appear in large numbers in all three bales within a few days after planting, a sign that the inside of the bales was decomposing. There did not appear to be any damage from animals as was experienced in 2015 (skunks or other animals digging in the straw due to the smelly organic fertilizer used). However, flies were in abundance. Fertilization with half-strength fish emulsion began in mid-May and continued monthly throughout the summer. Plants were irrigated with shrubblers (sprayers attached to drip irrigation supply line) that came on daily for 5 minutes. During the extreme heat of the summer, hand watering was done to provide supplemental irrigation. Both bales of rice straw began collapsing soon after being planted, and by mid-June, they had shrunk considerably and the height had diminished. The collapse was especially bad at the edges and corners of the bales. The wheat straw, however, held up well. As was done in 2015, the bales were encircled with ratchet tie down straps, and bamboo stakes were inserted between the straw and the tie down straps (see photos in the 2015 article). This method kept the bales under compression but did nothing to keep the bales from collapsing. By late May and early June, we started noticing yellow leaves on several of the plants, particularly on Dwarf Russian Swirl and Dwarf Arctic Rose. The yellowing was throughout the plants, not just on older leaves at the bottom. The yellow leaves were regularly removed as a precaution against potential disease. In early June an email was sent to Craig LeHoullier, project leader of the Dwarf Tomato Breeding Project, giving him an update on the tomatoes and advising him of the issue of yellowing leaves on some of the plants. Mr. LeHoullier advised that the density of the foliage on the dwarfs tends to make them susceptible to foliage fungal diseases such as alternaria (early blight) and septoria. Both start as brown spotting on lower foliage, often with yellow proximal (center) areas. 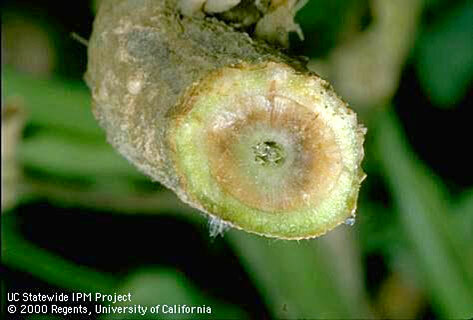 The disease can work itself up the plant and lead to its premature demise. Two of the plants with the most problem (Dwarf Russian Swirl and Dwarf Arctic Rose) could show a bit more susceptibility to foliage diseases than some of the other dwarfs. The yellowing problem continued, along with several branches and stems turning brown and dying. Fruit quality was poor, probably due to sunscald. The yellowing was more noticeable on all but one of the plants (Rosella Purple) by late July. On July 27, Dwarf Arctic Rose was removed and bagged, along with roots and fruit, and taken to the State Lab for diagnosis. We suspected Fusarium wilt since the plant showed the same symptoms of Fusarium that had been confirmed in the past on other tomato plants: yellowing of leaves on one side of plant as well as throughout, dead leaves, browning of the vascular system of lower stems. By this time, almost all of the plants showed yellowing of the leaves and dying branches, some being worse then others. The exception was Rosella Purple, which looked healthy. To our dismay, the State Lab confirmed that Dwarf Arctic Rose had Fusarium oxysporum f. sp. lycopersici. One of the selling points about growing in straw bales is that there are no soil borne diseases in the straw. Unfortunately, we did not experience that in the summer of 2016. All six of the tomato plants were started from seeds and were grown in plastic containers that had been washed and sterilized with a 1:9 bleach/water solution. The growing media was sterilized seed-starting mix and potting soil. At no time was garden soil introduced into the straw. Question: How can a soil borne fungal disease like Fusarium wilt affect tomato plants that have never been grown in soil, and when every precaution had been taken not to contaminate the plants with the fungal disease? It is possible for Fusarium to be transmitted via seed; however, it is very uncommon for this to happen because commercial seed companies use various processes to maintain clean seeds (hot water and/or chemical treatments; ensuring seed was obtained from plants free of the disease). Fusarium can also be transmitted by contaminated tools, and it can occasionally be airborne under certain environmental conditions. So at this point, we do not know how the disease was transferred to the plants, but it appears that most of the plants were affected. When the plants were removed from the straw bales, we cut the lower stem and noticed the classic inside browning that indicates Fusarium (see photo at right). The exception was Rosella Purple, which had no browning of the lower stem, so it appeared to have some resistance to the disease. While we had difficulty growing tomatoes in straw bales in 2016, our past experience has been very good with no soil borne diseases on any of the crops previously grown. It is apparent that Fusarium is very common in our area and is even able to infect plants not grown in garden soil. Our plan for the 2017 summer garden is to again grow the same six dwarf tomato varieties in three straw bales. We will again be diligent about sanitation and careful not to introduce anything that could carry the Fusarium wilt fungal spores. Straw Bale Gardening (PDF) Garden Note 160, explains the basics for starting a straw bale garden in your yard. Return to our Straw Bales introduction for links to other years. 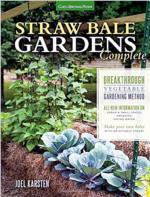 There is also a free ANR publication on straw bale gardening (PDF). 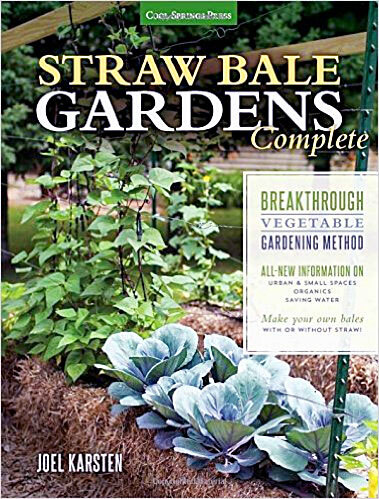 The book Straw Bale Gardens (Joel Karsten, Cool Springs Press) provides detailed information about setting up the straw bales and all aspects of straw bale gardening. The author's website also provides information and photographs that may be helpful if you would like to try growing vegetables in straw bales.